We count on unfinished spaces like the garage for storage, so utilizing all of the available room becomes essential in meeting storage needs. Sometimes the only alternative for storage is to look up. Most garages have unfinished space above the rafters. But, there are lots of plans and hardware available online and at the local hardware store to help you maximize other space in the garage as well. Building a loft may suit your needs or contact one of the many companies offering services to design and install storage systems. If you are interested in tackling it yourself, consider using Fleximounts storage accessories. For example, heavy gauge steel racks are available in five sizes and the height can be adjusted from 22” to 40”. The packaged solutions offered, guide you to choosing the products that best fit your space. A gallery of photos shows real life garages with storage solutions obtainable with the use of these products that also include wall shelves. Storage hooks are available that work with this system, so not only can you stow all of your holiday decorations off the floor and out of the way, but you can hang items like extension cords and lawn tools. Bicycles can take up lots of floor space in your garage, but there is a multitude of bike racks to help solve this storage problem. When your head stops spinning at examining just how many choices are out there, here is a clever one for you to consider. The Racor Pro Bike Lift allows you to store a bike overhead without the clumsy dance of turning it upside down and boosting it over your head. Just roll your bicycle into the garage, hook it up, and hoist it with the cord and pulley system. 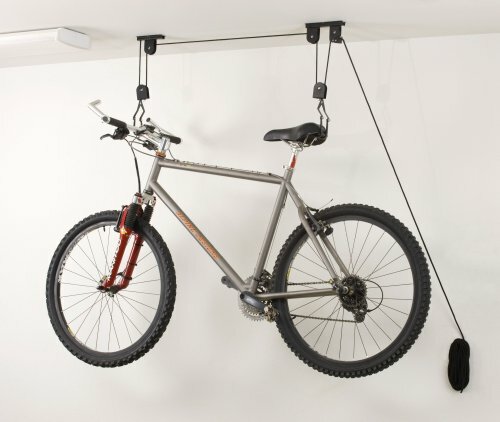 This lift will work with ceilings up to 14’ high and bikes up to 50 pounds, plus the price is less than $20.00. You also may want to check out the ladder lift manufactured by the same company. If you have more than one person in your household participating in more than one sport, you already know the effort it takes to keep track of all the gear. Gym bags, bats, balls, shin guards, skates, helmets…Are they in your trunk? No, that was emptied out for hauling groceries and stuff was tossed on top of the freezer or under the workbench. How about a locker system in the garage, for keeping track of these things? There are numerous websites offering a variety of lockers in different colors, sizes and materials. Consider a locker for each family member to encourage responsibility of keeping track of their own equipment. Also, nobody’s stuff has to touch anyone else’s stuff, definitely a plus with feuding children. Whether you’re storing bikes, sporting equipment or something else in the garage, there is a storage solution for you!